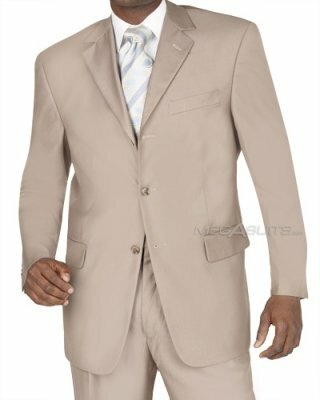 Beige suits can belong in with the tan and khaki family of colors. It’s a way to lighten up your wardrobe and add a little more spice. These definitely have their place and just like with other lighter colors, are not as versatile as your standard navy blue or gray. Beige is a good option for warmer weather in general, although I don’t buy into any hard rules like only wear it between this day and that day, or only between spring and fall. In LA or Miami, these can fit in most days of the year. While this color is often seen as a more casual look, I think it can fit into the right office. It might not work in banking or law, but other more lax environments might be OK. If you are looking for a business look, a little bit of a darker shade more towards a brown would be a better bet. The lighter tan and khakis are good for a more relaxed night out.